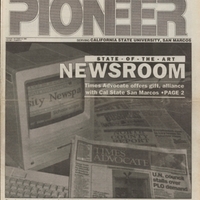 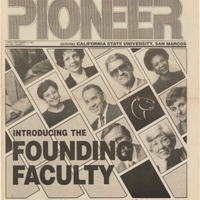 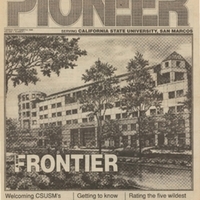 Volume 1, Number 8 of the first independent student newspaper on the CSUSM campus. 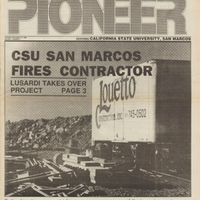 As the semester comes to a close, the Pioneer outlines their top stories of the first semester at Cal State San Marcos. 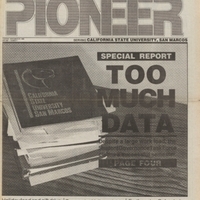 Volume 1, Number 5 of the first independent student newspaper on the CSUSM campus. 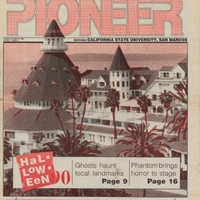 While Halloween celebrations dominate this issue, the Pioneer staff editorial page provides recommendations for the upcoming November election. 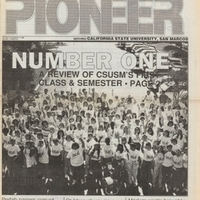 Volume 1, Number 3 of the first independent student newspaper on the CSUSM campus. 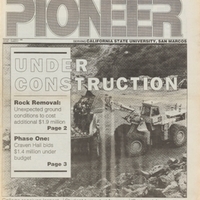 This issue has cover stories about the construction of the campus; removing rocks and the contractor bids for the building of Craven Hall.